Pope Francis arrives at the airport in Abu Dhabi, United Arab Emirates, Feb. 3, 2019. The pope on Sunday became the first pontiff to visit the Arabian Peninsula, on a trip intended to improve relations with the Muslim world and bolster the Mideast’s persecuted Christian minority. 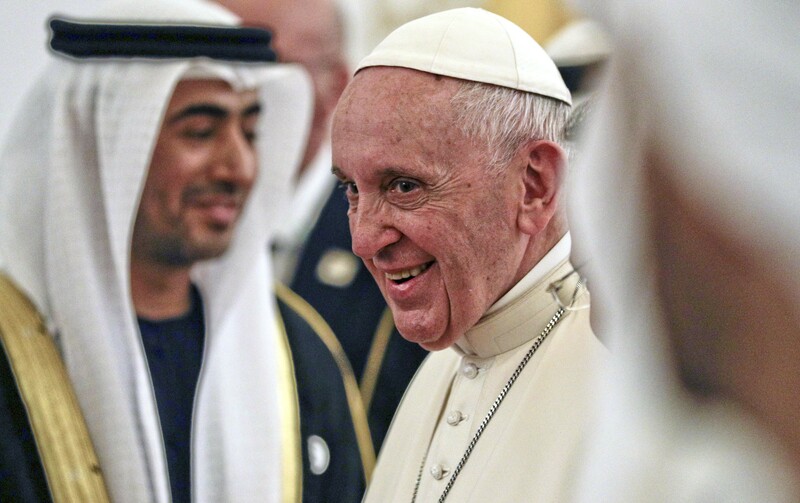 ABU DHABI, United Arab Emirates — Pope Francis used the keynote address of his roughly 40-hour stay in the United Arab Emirates to breach delicate taboos Monday, specifically mentioning Yemen, where his hosts are engaged in a brutal war, and calling on countries throughout the Gulf region to extend citizenship rights to religious minorities. “Human fraternity requires of us, as representatives of the world’s religions, the duty to reject every nuance of approval from the word ‘war,'” Francis said at the towering Founder’s Memorial in Abu Dhabi.